New images of Earth's Moon reveal more than can be seen with the naked eye, thanks to the combined efforts of the two largest radio telescopes of their kind—the National Radio Astronomy Observatory's Green Bank Telescope (GBT) in West Virginia and the Arecibo Observatory in Puerto Rico. To make these images, radar signals beamed from Arecibo's powerful transmitter penetrated far below the Moon's dusty surface. The signals then rebounded back and were picked up by the sensitive receivers on the GBT. This observing technique, known as bistatic radar, has been used to study many objects in our solar system, including asteroids and other planets. The first image reveals previously hidden features around an area known as Mare Serenitatis, or the Sea of Serenity, which is near the Apollo 17 landing site. The radar observations were able to "see" approximately 10-15 meters (33-50 feet) below the lunar surface. The light and dark features are the result of compositional changes in the lunar dust and differences in the abundance of rocks buried within the soil. The second image is a similar observation of the lunar impact crater known as Aristillus. The radar echoes reveal geologic features of the large debris field created by the force of the impact. 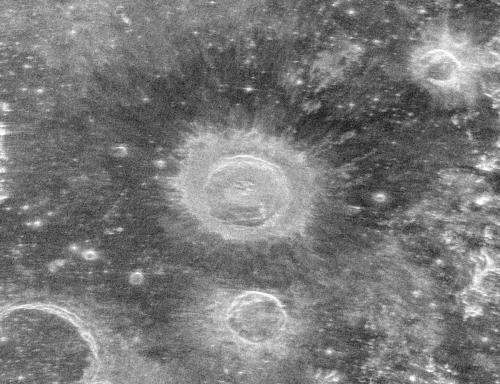 The dark "halo" surrounding the crater is due to pulverized debris beyond the rugged, radar-bright rim deposits. 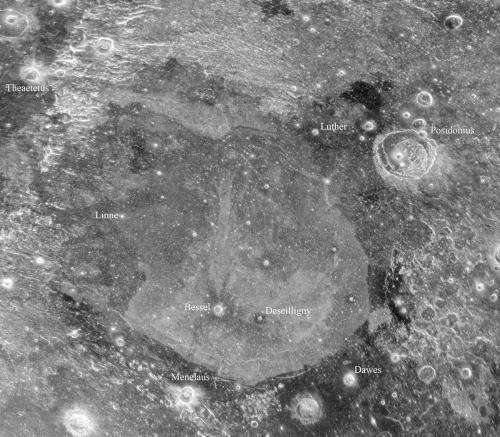 The image also shows traces of lava-like features produced when lunar rock melted from the heat of the impact. The crater is approximately 55 kilometers (34 miles) in diameter and 3.5 kilometers (2 miles) deep. These images help planetary scientists interpret the complex history of the Moon, which is often obscured by dust layers built up over billions of years, better understand the geology of earlier landing sites, and plan for future lunar exploration.